I hope you all had a wonderful Easter weekend and got to spend lots of quality time with your families. This was Baby Girl's first Easter, so of course we had a lot of fun. I love experiencing life through her eyes. Our church had a petting zoo, complete with pony rides, and a picnic and egg hunt after service, and then we had a cookout with our little family in the evening. It was a long, busy day, but a perfect one. All three of us enjoyed ourselves immensely. Three-day weekends are lovely, but it sure does make it difficult to get back in the swing of things come Monday morning. In fact, I think Mondays--especially ones after holidays--call for some serious comfort food to help ease the transition back into the work week. 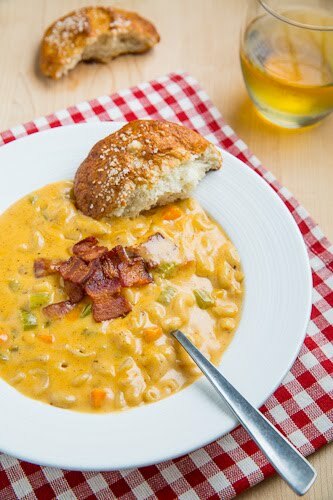 The recipe on today's menu, Beer Mac n Cheese Soup by Closet Cooking, definitely qualifies as comfort food. Image from Closet Cooking. Please respect the creator and pin from the original site. This is a pretty hearty soup with a good deal of flavor and just the right amount of spice. Of course, a good portion of that savory flavor can be attributed to the beer, so make sure you use a good one. (Promise me you won't use a Bud Light, people). I went with Alaskan Amber, and it was perfect for this recipe; it complemented the cheese well. Oooh, all that cheese! I am a sucker for anything with lots of cheese! This soup can easily be converted to a vegetarian dish by omitting the bacon and using vegetable oil to saute the vegetables. We didn't do that, of course--we like bacon too much--but you could. Speaking of those vegetables, I will say the carrots seem a little strange in this. Next time I will probably leave them out, and maybe add in some potatoes in their place. The prep time for this is a little long, but not terrible. You just have to allow yourself some time to cook the bacon, chop the vegetables, and saute the vegetables before you actually start cooking the soup. Once all the prep is done, the soup comes together quickly. Overall, I give this soup 4 out of 5 stars. Hubby liked it, I liked it, and we will definitely be making it again! In the mood for soup? Check out my Mexican Chicken Soup. Yes, it really is! Thanks for stopping by! I first thought your baby was sitting on a saddled dog! Such a tiny minature. That is a great comfort food recipe if I've ever seen one! Yum! I am doing a six weeks to summer but I will file this one away for sure! It looks too good to miss out on! Good luck with your six weeks to summer program! I'm working on getting healthier, too--recipes like these are reserved for my occasional cheat day, and boy, is it good! Ummm this sounds awesome! Mac and Cheese is my all time favorite! Pinning! I love mac and cheese, too--in all forms! This sounds so good. I think my thighs would hate me! Oh yes, this is definitely a splurge meal! Havent tried the soup but wow! looks yuuummmmmy! It's pretty tasty, you should try it! Thanks for stopping by!